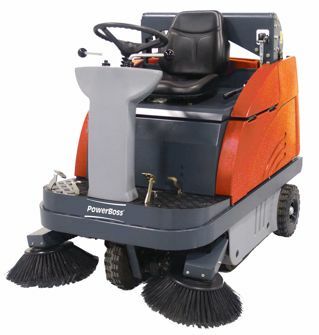 The PowerBoss Apex 47 rider sweeper is designed for maneuverability and heavy duty industrial sweeper strength. With its front wheel drive system it holds a 70” turning radius allowing you to reach tighter spaces while maintaining top quality dust control. Featuring its two 18” side brooms, 28” main broom, 2.1 cubic ft. hopper capacity, and 60” high dump, the Apex 47 allows you to clean up to 77,500 square feet per hour.